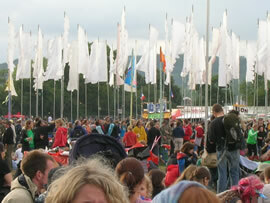 When we think of festivals the term that comes to mind is ‘unadulterated fun’. There’s nothing quite like spending a few days camped in a field with friends listening to your favourite music. Even if your experience is strictly U-rated, there’s something wonderfully rebellious and bohemian about festivals which sends our minds back to the 70s. Suddenly a floral head garland and a band T-shirt combination seems like the best idea ever. Is that a native American war bonnet you have there? Well bring it on. Yes, we certainly view festivals through rose-tinted glasses and are more open to embracing a free and easy lifestyle than at any other time of the year. However, when we think about the reality of being in a probably mud-bogged field for four days, with no electricity or proper bathroom, suddenly the fear starts to set in. If we’re being honest, festivals – while brilliant – can be like a bit of a test in endurance, especially if it’s your first time. Everyone needs to know a few tips and tricks before they go to ensure they get through the experience in one piece. Luckily, there are a few ways you can maintain a degree of ‘home comfort’ while preserving the au natural, earth-loving bohemian spirit of the festival. The worst thing about being at a festival is the lack of a readily available shower. By the end of day two you probably wouldn’t say no to someone pouring disinfectant over you and if it rains you purposefully put your head in the firing line in the hope it will make your hair a bit cleaner. There is a better way, however, and more and more people are cottoning on to the benefits of ‘dry’ shampoo and body wash. Nilaqua No Rinse Shampoo will be something you can’t live without if you’re heading to a festival this year. In a handy travel size, this shampoo is free from alcohol and parabens. With this product you can give your hair a good scrub without water and the mild non-irritating formula will leave hair soft, clean and free from residue. All you have to do is apply the liquid and massage to a lather. To get rid of it, towel dry. This means more than a quick rub – you need to be thorough to avoid streaks and residue. The Nilaqua Waterless Body Wash works in the same way. This mild, non-irritant formula is free from alcohol, pH balanced, and doesn’t contain SLS or parabens. What’s great about this wash is that unlike wipes, it won’t dry out skin. This makes it the perfect way to stay clean, especially if your skin is a bit sensitive. The sun is your best friend at festivals. Not only is it the only thing that probably stands between you and your tent being washed away, it is your connection to the outside world. We’re not talking about shadow signals, here. There is now a wide array of solar-powered chargers that can help to keep your mobile powered up and ready to go throughout the festival. 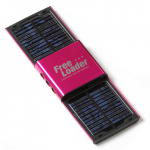 The FreeLoader is a small portable charger that will power most handheld devices, from iPods to PSPs. This means that you can ensure you’re entertained during any festival downtime you may have – i.e. queuing for the bar. At a festival you will be functioning on a few hours sleep and, let’s face it, food that isn’t exactly winning when it comes to nutritional value. This means your body is going to be more vulnerable to illness, tiredness and, if you’ve engaged in a spot of social lubrication, hangovers. The only way to ensure you’re in the sort of shape you need to be to enjoy the festival to the full is to make sure you’re getting essential vitamins and minerals. A top tip is to fill a cool box with lots of great fruit and vegetables, such as bananas, berries, avocados and carrot sticks – basically anything you can eat on the go.